Welcome to visit MOMO ASIA web site!! momo will provide many interesting things happen around her to you,and introduce her life,her travel,and even her country. I hope you will enjoy it. 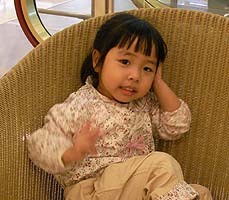 If you are chinese,you can visit momo's blog(http://blog.momo.asia),there are more stories about momo over there. MoMo! live in Taiwan.An active little girl who like dancing. She always hopes to grow faster that she can do many things like her parents.But she doesn't like to eat dinner. So she is smaller then other children at the same age. As momo is just a little girl. Her parents will serve as managers of this site. They will write many articles about her, and answer all emails from the world. Copyright © 2019 momo. All Rights Reserved. it's better if you put more photos and videos here. I like momo,she is so lovely!! I like your site, I will visit it frequently.